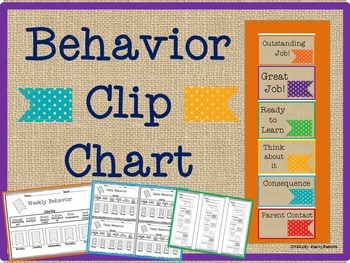 This Behavior Clip Chart is a great way to manage your classroom. It promotes positive behavior. Every student begins their day on “ready to learn”. Students can move up two more times on the chart by making good choices. There is also a section for students to think about their choices and a section if they have a consequence for their behavior. The last spot is if there is a need for parent contact. Included are 3 different log sheets to track daily or weekly behavior. I use clothes pins with the student’s numbers to keep track, but you can also put the chart on a magnet board and have the students move their magnet. 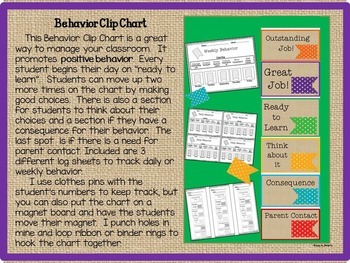 I punch holes in mine and loop ribbon or binder rings to hook the chart together.